For the first time, a Turkish film has taken a serious look at the anti-Greek riots in Istanbul on Sept. 6-7, 1955, a horrific mob attack that triggered the rapid decline of the Greek Christian community — at the time numbering some 120,000 to 135,000 people. Widespread destruction was wreaked on homes, businesses and Greek Orthodox Church property. Businesses and homes owned by Armenians and Jews were also targeted. An article in Today’s Zaman, a Turkish paper, describes the film Güz Sancısı, or The Pain of Autumn, as a love story of Behçet and Elena, a Turkish man and a Greek woman, set against the tension that culminated in the real-life destruction of 5,300 businesses and houses owned by Greeks, Armenians and Jews. The paper, citing distributor Özen Film, said that more than 500,000 people have seen the film since its release in March. Visit the official site here. 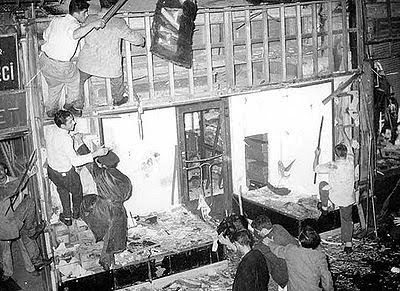 "On the night in question, thousands of protesters converged on central İstanbul, incited by news reports that Greeks in Thessaloniki had bombed the childhood home of Mustafa Kemal Atatürk, the founder of modern Turkey. It emerged later that the reports were false. Tension between Turkey and its historical rival Greece was high at the time over Cyprus. Police and soldiers stood by when the protest turned violent. Cemeteries were desecrated, churches were looted and about a dozen people died, said Dilek Güven, a historian and author of a 2005 book on the subject, The September 6-7 Events. Hundreds of women were raped, she said. Damage was estimated at $50 million, or about $400 million in today’s terms. Most of the attacks were against Greek-owned targets, but almost a third were aimed at property owned by Armenians and Jews. More than 5,000 people were arrested and most were later acquitted. Prime Minister Adnan Menderes and two members of his government, deposed in a 1960 military coup, were found guilty the following year of violating the constitution and executed. During the trial, one of the principal charges the judges heard was that the Menderes government was behind the 1955 events. Research by Güven and others has shown the conspiracy ran deeper, involving the military and the intelligence service, and was aimed at pressuring minorities to abandon their property and leave the country." "As I was seeking answers to these questions, the Greek families in our neighborhood started to move to other places or go to Greece. After 1963 none of them were left. They left Istanbul. They took with them an important culture, a color and a different lifestyle. They left us alone in Istanbul to live our colorless lives. Later on we were full of regret, but by then it was too late." Go here to read an excerpt from Speros Vryonis, Jr.’s The Mechanism of Catastrophe: The Turkish Pogrom of September 6-7, 1955, and the Destruction of the Greek Community of Istanbul. Vryonis dedicated his book to photographer Demetrios Kaloumenos who, at great risk to his life, recorded the scenes of destruction following the anti-Greek riots, including the destruction and desecration of Orthodox churches, monasteries, cemeteries and businesses. You can watch the whole movie on Youtube with English captions beginning here.